Walter Horatio Pater (4 August 1839 – 30 July 1894) was an English essayist and literary critic. The presence that thus rose so strangely beside the waters, is expressive of what in the ways of a thousand years men had come to desire. Hers is the head upon which all "the ends of the world are come," and the eyelids are a little weary. It is a beauty wrought out from within upon the flesh, the deposit, little cell by cell, of strange thoughts and fantastic reveries and exquisite passions. Set it for a moment beside one of those white Greek goddesses or beautiful women of antiquity, and how would they be troubled by this beauty, into which the soul with all its maladies has passed! All the thoughts and experience of the world have etched and moulded there, in that which they have of power to refine and make expressive the outward form, the animalism of Greece, the lust of Rome, the reverie of the middle age with its spiritual ambition and imaginative loves, the return of the Pagan world, the sins of the Borgias. She is older than the rocks among which she sits; like the vampire, she has been dead many times, and learned the secrets of the grave; and has been a diver in deep seas, and keeps their fallen day about her; and trafficked for strange webs with Eastern merchants: and, as Leda, was the mother of Helen of Troy, and, as Saint Anne, the mother of Mary; and all this has been to her but as the sound of lyres and flutes, and lives only in the delicacy with which it has moulded the changing lineaments, and tinged the eyelids and the hands. The fancy of a perpetual life, sweeping together ten thousand experiences, is an old one; and modern thought has conceived the idea of humanity as wrought upon by, and summing up in itself, all modes of thought and life. 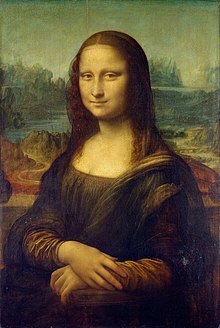 Certainly Lady Lisa might stand as the embodiment of the old fancy, the symbol of the modern idea.